Islamabad (CNN) -- A Muslim cleric leading a self-proclaimed movement to clean up politics in Pakistan by throwing out the current leaders in favor of a caretaker administration called on thousands of supporters to join his campaign. "It's the beginning of the revolution," Tahir ul Qadri told a rally in Islamabad. "Dissolve federal and provincial governments by tomorrow morning; otherwise, the public will force them to step down!" Qadri urged the demonstrators to remain in the capital until they achieve their goals. "Now and onward, you have to take care of Islamabad," he said.He referred to President Asif Ali Zardari as ex-president and to Prime Minister Raja Pervez Ashraf as ex-prime minister. "Today, the president and the prime minister have become ex as (they) won't have their government tomorrow," he said. The rally was held Monday night in Islamabad's "blue zone" in the center of the capital. Qadri spoke early Tuesday. The group's numbers fell far short of what organizers of the "Million Man March" had predicted, with witnesses estimating that some 20,000 people took part. 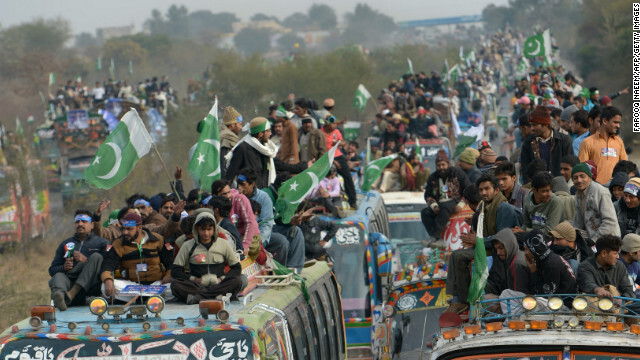 Many more followed the event on television as the participants, led by Qadri, headed toward Islamabad with police and soldiers lining the rally route. Video showed a convoy of buses, vans and cars packed with participants waving the national flag en route to the capital. Some joined the procession on foot. Qadri, who traveled in a bulletproof van, has promised a Pakistani equivalent of Egypt's Tahrir Square protests. When the marchers arrived at the rally site, near Parliament and the presidential home, they joined more than 1,000 other protesters who had arrived earlier in the day as part of a demonstration calling for cleaning up national politics before elections this year. "We want change in the establishment and we want to save our country," one man told CNN affiliate GEO TV. After eight years in Canada, Qadri returned last month to Pakistan, where he is waging a campaign against the political elite. Pakistani Interior Minister Rehman Malik, who visited rally sites Monday by helicopter, said the turnout numbers showed that Qadri's event had "badly failed." "We want change! We want change!" chanted some demonstrators prior to Qadri's speech. One man in a male-only area told GEO TV viewers watching at their homes that change does not occur while sitting down. "We all must rally and come together for change and a better future and stronger Pakistan," he said. One female protester, rallying in the space provided for women and children, said she was prepared for a long demonstration. "We have come here with our bedding and food supplies," she told GEO TV. "We will stay here for as long as it takes to change the present situation in Pakistan." Qadri has called for a caretaker administration to replace the current government and to carry out election reforms. His suggestion that the judiciary and the military weigh in on the composition of the interim government has raised concerns in a country where military leaders have repeatedly seized power and ruled for long periods of time. Some Pakistanis, noting that Qadri served as a lawmaker in the early 2000s, when Gen. Pervez Musharraf was leading the country, have suggested he may be working on behalf of the military. Qadri maintains that he is simply seeking to ensure a corruption-free electoral process. The current government and opposition have both rejected his requests for a caretaker administration, insisting that nothing will stand in the way of timely elections and the democratic process. "We will not succumb to these illegal demands," Malik said last week. The only political party that had supported Qadri's demonstration, the Mutahida Qaumi Movement, withdrew that support last week. The movement is a coalition partner in the current government. If this year's elections take place without major difficulties, it would represent the first time in Pakistan's history that a civilian government would have made it through a five-year term. Supporters say that Qadri aims to effect positive change. Corruption is widely considered a chronic problem in Pakistan's political system; President Zardari has served prison time on corruption charges. The problem appears to be regional. Qadri's campaign comes more than a year after anti-corruption demonstrator Anna Hazare roiled Indian politics with a hunger strike that called for the introduction of strong anti-graft measures. Qadri gained worldwide attention in 2010 when he declared a fatwa, or religious ruling, on terrorism and said it "cannot be permissible in Islam." That occurred during his time in Canada, when he spoke out in videos and books. His supporters also point to his Lahore-based religious welfare organization, Minhaj ul Quran, which promotes "true Islamic teachings." According to its website, it has up to 280,000 members worldwide and works to build schools around the country to teach the Quran. CNN's Shaan Khan reported from Islamabad and Jethro Mullen wrote from Hong Kong, and Mark Morgenstein updated from Atlanta. CNN's Aliza Kassin, Saima Mohsin and Nasir Habib also contributed to this report.